Bears a Mint State 70 grade from the Numismatic Guaranty Corporation. Features the latest design in the series, the Cape Buffalo. Rwandan Wildlife Series coins are unique compared to other options from the African continent. While other coins are not available over multiple years or feature the same design theme, the Rwandan Wildlife Series offers variety to collectors. Each new release in the Rwandan Wildlife Series depicts a new native creature from the African continent. Launched in 2008 with a gorilla design, these coins all feature a common obverse background field that shows the African continent in its entirety. In the lower-left field you’ll find a new animal species represented each year. 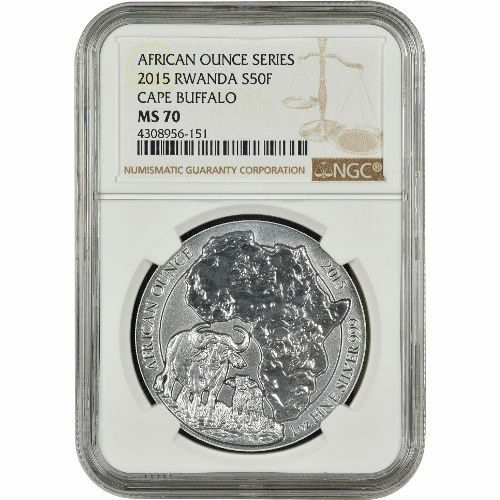 The 2015 1 oz Silver Rwandan African Buffalo coins available now from Silver.com have a perfect grade from the NGC. Coins with a Mint State 70 grade have full, original mint luster and exhibit no detracting flaws of any kind on the surface areas. On the obverse you’ll find the unique 2015 African Buffalo design, which shows an adult buffalo with its young calf. Engravings include the phrase “African Ounce,” as well as the coin’s weight, purity, and metal content. 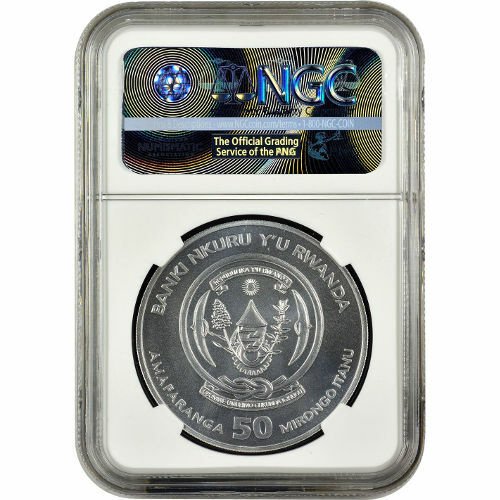 The reverse of all coins in the series features the coat of arms for Rwanda. All engravings on this face of the coin are in Kinyarwanda, a local dialect spoken by tribes in the region. These engravings include “Central Bank of Rwanda,” the national motto, and the coin’s face value in Francs. Germany’s BH Mayer Mint, a private facility, produces these coins under contract with the Central Bank of Rwanda. The family-owned facility was opened in the 1870s. Please contact Silver.com at 888-989-7223 with any questions. You can also reach us online using our live chat and email features.